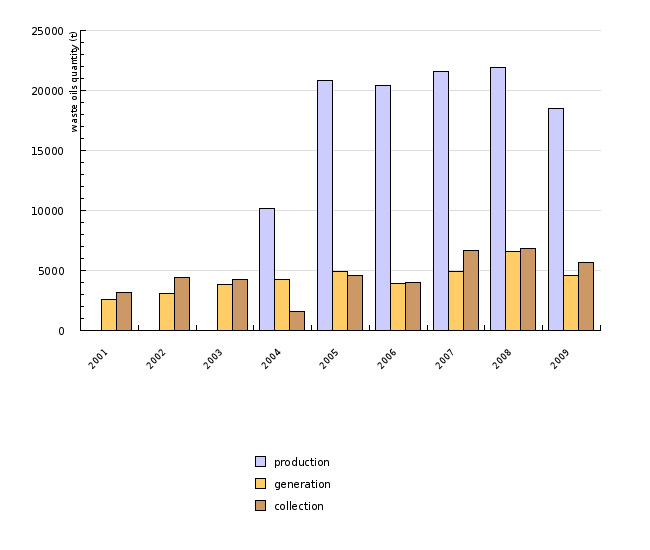 Since 2004, the share of collected waste oils in relation to the quantity of oils sold grew from 15% to 30% in 2007, which is the target figure. In recent years, the share of recovered or incinerated waste oils compared to deposited oils is also increasing, which shows that this waste is used as additional energy-generating product. According to 2004 data, 4145 tonnes of waste oils were recovered, and 134 tonnes deposited. 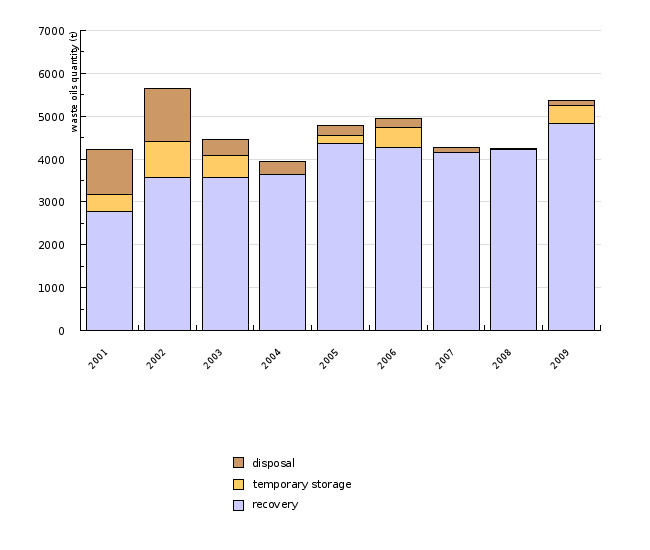 The indicator shows annual quantities of oil placed on the market, of generated and collected waste oil, and of deposited and recovered waste oil under R9 recycling procedure (oil re-refining or other reuses of oil) or under R1 procedure – co-incineration (uuse principally as a fuel or other means to generate energy). - other mineral or synthetic waste oils. Waste oils are hazardous waste and may not be mixed with other hazardous and non-hazardous waste. Treatment of waste oils is determined by the Decree on the disposal of waste oils (Official Gazette of the Republic of Slovenia, No. 25/08). The exception are waste oils which are mechanically treated by the producer at a facility at the location of their generation in such a manner that they can be reused for the same purpose within 12 months following their generation at the latest (Decree on the disposal of waste oils). - To increase the quantity of recovered waste oils compared to the quantity of deposited waste oils (incineration of waste oils). The quantity of oils placed on the market is increasing and amounted to 21,593 tonnes in 2007, which is double the figure of 2004. Also the share of collected waste oils is increasing in relation to the quantities sold. From 15.3% in 2004 it increased to 19.5% in 2006 and in 2007 the share of collected waste oils relative to the quantities sold reached 30.9%. 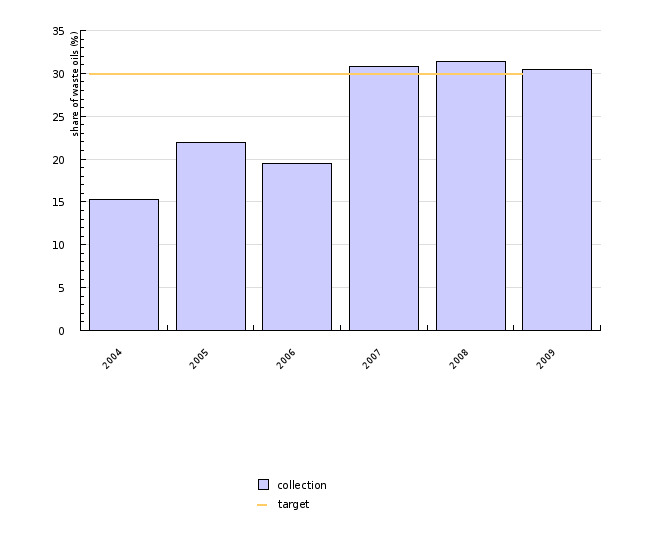 In 2007 we, thus, hit the target set in the Operational Programme. Further waste oil management follows the trend towards recovery and co-incineration of waste oils, highlighting the use of this waste as a source of additional energy-generating product. In 2007 Slovenia had 10 registered waste oil collectors, one legal entity disposing waste oils incineration, and two legal entities engaged in recovery of waste oils (by co-incineration and recycling). In average, the quantity of both generated and collected waste oils is increasing. One of the reasons for larger quantities of generated and collected waste oils in 2005 could have resulted from the situation on the market. The discrepancies between the quantities generated and collected in individual years are attributed to an incomplete record of liable entities, particularly the generators of waste oils (2000 was the first reporting year). Furthermore, generators of less than 20 kg or 5 kg of waste oils were also not required to report (amendment of the Rules on the management of waste, Official Gazette of the Republic of Slovenia, No. 13/03). The quantity of waste oils collected in a specific year may be somewhat higher than the oils generated due to prior storage of the oils. Records by the EARS, show that most waste oils are used as fuel, for co-incineration (recovery of waste oils), while some smaller quantities have also been recycled (bur no more that 3 tonnes per year). The objectives have been taken from the Operational Programme of waste oil management for the period from 2003 to the end of 2006. Slovenia has been adhering to the basic system of collection, recovery and disposal of waste oil since 1998. The main foci and provisions regarding the programme of waste oil management are stipulated in our legislation, in particular in the Decree on the disposal of waste oils (Official Gazette of the Republic of Slovenia, No. 25/08, implemented since March 2008), which is harmonized with the EU directive on the disposal of waste oils and the Decree on waste management (Official Gazette of the Republic of Slovenia, No. 34/08, implemented since April 2008). In 2007, this topic was still regulated by the Rules on waste oil management (Official Gazette of the Republic of Slovenia, Nos. 85/98 and 50/01) and the Rules on waste management (Official Gazette of the Republic of Slovenia, Nos. 45/00, 20/01, 13/03, and 41/04 – EPA – 1), which were later in 2008 superseded by the two above mentioned Decrees. The relation between lubricating oils and liquids placed on the market (raw material, products) and waste oils (waste) is best seen from the Decree on environmental tax on the use of lubricating oils and liquids (Official Gazette of the Republic of Slovenia, No. 53/05). The polluter who places lubricating oils and liquids on the market is namely obliged to pay environmental tax collected by the Customs Administration of the Republic of Slovenia. The data are derived from a database on the management of waste at the Ministry of the Environment and Spatial Planning - Environmental Agency of the Republic of Slovenia as well as the annual reports submitted to the Environmental Agency of the Republic of Slovenia by the collectors, recoverers and disposers of waste oils. Data on generation of waste oils are gathered as per the Decree on waste management (Official Gazette of the Republic of Slovenia, No. 34/08) (Up to 2008, according to the Rules on waste management (Official Gazette of the Republic of Slovenia, Nos. 45/00, 20/01, 13/03, and 41/04 – EPA – 1). The Decree stipulates that each generator of more than 5 kg (20 kg up to the year 2002) of hazardous waste per year must submit a report on the waste generated and its management to the competent Ministry (Environmental Agency of the Republic of Slovenia). he data on collection were gathered as per the Rules on waste oil management (Official Gazette of the Republic of Slovenia, Nos. 85/98 and 50/01), and since 2008 the data have been gathered as per the Decree on the disposal of waste oils (Official Gazette of the Republic of Slovenia, No. 25/08). These reports must be submitted by the liable entities to the Environmental Agency of the Republic of Slovenia by March 31 of the current year with data for the preceding calendar year. According to the Decree, anyone who performs an activity which generates waste oils must ensure the containment and storage of such oils in an environmentally safe manner, and then deliver the oils to a qualified collection service which will provide for further recovery or disposal. Reports on the generation of hazardous waste are entered into the database. Reports on the collection of waste serve as a basis for the preparation of an annual report on the collection of waste oils. The content of each completed form on the generation of hazardous waste is examined. The content of reports on the collection of waste oils is verified by the Environmental Agency of the Republic of Slovenia. The Agency also checks whether all the liable entities have submitted their reports and obtains those that are missing. The quantity of lubricating oils and liquids placed on the market which were subject to environmental tax is the difference between the quantity of lubricating oils and liquids generated in the Republic of Slovenia, acquired from other EU Member States or imported to the Republic of Slovenia from third countries and the quantity of lubricating oils and liquids exempt from environmental tax. Public record of this quantity is kept by the Ministry of Finance, Customs Administration of the Republic of Slovenia, and the legal basis for the levied environmental tax is the Decree on environmental tax on the use of lubricating oils and liquids (Official Gazette of the Republic of Slovenia, No. 53/05). According to the provisions of legal acts applied to the management of waste oils, waste oils are hazardous waste and may not be mixed with other hazardous and non-hazardous waste. Generators of waste oil are obliged to deliver the oil to collection services unless they hold permits for disposal or recovery. They are obliged to set up suitable delivery points. Waste oils must be deposited at collection centres, suitable delivery points or collection facilities of waste oil collectors. Collection may only be carried out by holders of a relevant permit issued by the ministry. Each collector must have a collection centre and must ensure either recovery or disposal of waste oils. In practice, however, generators often deliver waste oils directly to recoverers or disposers, without mediation of waste oils collectors. This is the reason why in some years the data gathered show that quantities recovered exceed the collected quantities of waste oils. Recovery is the preferred choice if technically feasible and if its cost is not unreasonably higher than the cost of disposal. One of the forms of recovery is the utilisation of waste oils for energy – co-incineration in accordance with recovery procedure R1. A detailed analysis of waste oil management in Slovenia is conducted only for 18 classification numbers of waste oils without substantial water content, and for which a special authorisation for the collection of waste oils had to be obtained from the Ministry (this only applies to the period up to the end of 2007, when the Rules on waste oils management and the Rules on waste management still applied).